Amusements with FreeCAD: Drawing Module: A Sneak Peak! The left is the Drawing Module using QGraphicsView elements and the test model is on the right, although I am trying to work out why the projection isn't correct - maybe it's first angle projection? Also the edges that don't match up are arc of ellipses that aren't correct but that should be trivial to fix. 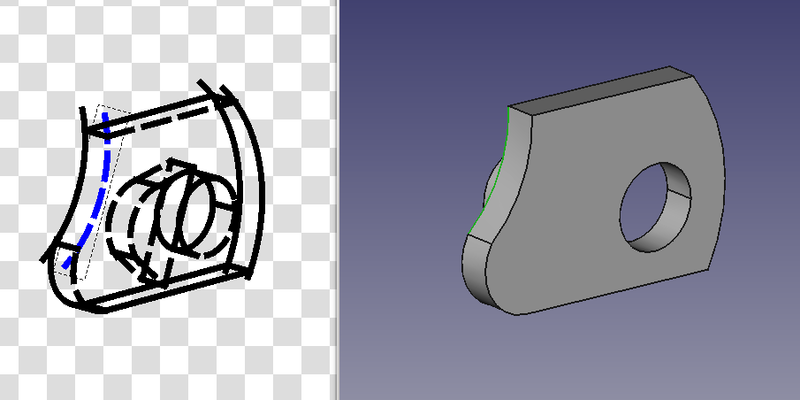 The point is I have manage to correctly project edges and rebuild nearly all the edge references from the original model, I found that on some occasions because a curve is broken up, the references can be lost but these are nearly always in 3D views, which would be difficult to dimension. It also supports edge selection and moving this projected view around the canvas despite there being no template. The next step will be to tidy up the code and implement full interactivity and integration with FreeCAD's App::Property system, so that it can take advantage of the undo/redo framework. One of the frustrating things is not having anti-aliasing support in the opensource ATI drivers. Hi! I work with engineering website EEWeb.com and would love to do an exchange of website links and feature you as a site of the day on EEWeb. Let me know if this is of interest to you!